Wickenburg Breast Cancer Network, Inc. (WBCN) is a non-profit corporation, formed in 2009 to provide educational and emotional support as well as financial assistance for the diagnosis and treatment of breast cancer in Wickenburg and surrounding rural communities. 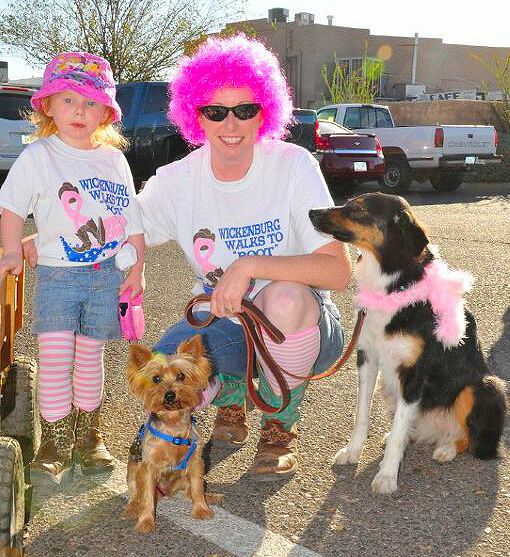 Our primary fundraising event is “Wickenburg Walks to BOOT Breast Cancer,” held every October in downtown Wickenburg, Arizona. The entire event is conducted by volunteers. Funds raised from this annual event are donated to the Pink Ribbon Angels (PRA), also incorporated as a 501(c)3 in 2009 by the non-profit Wickenburg Community Hospital Foundation to provide diagnostic breast cancer screening, biopsies, and other medical support for the uninsured and underinsured women and men in our rural communities. Applicants for the PRA Program must be between the ages of 35 and 64 and reside in Aguila, Bagdad, Circle City, Congress, Forepaugh, Hillside, Kirkland, Morristown, Peeple's Valley, Salome, Wenden, Wickenburg, Wittmann, or Yarnell. For further details visit the Pink Ribbon Angels website or contact PRA Director Joan McDermott at 928-684-5812. After the Pink Ribbon Angels are fully funded for local needs, remaining funds are distributed to organizations directly involved in research to eradicate breast cancer and toward local programs to support breast cancer survivors. ​If you would like to make a tax-deductible donation, please click the link below.